Product ID #: 213 - Ship Wt: 1 LBS.. Illustrated by Nancy Bartusch, 8.5" x 11"
"Handy" helps teach upper and lower case letters of the alphabet. 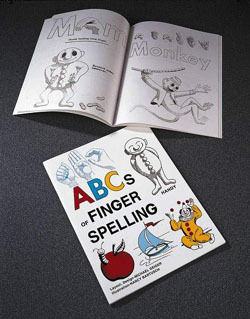 Includes printed letters and easy-to-follow drawings of the hand shapes. Also teaches simple words, with an object pictured on each page, i.e., an apple on the "A" page, a boat on the "B" page. etc.. Black and white drawings make this a coloring book too!